This is where the popular German premier league goalkeeper relaxes at home. Successful sports stars know that using a sauna regularly benefits their health and performance – which is why they relax in saunas on a regular basis. Based on the SHAPE sauna, Roman Weidenfeller asked KLAFS to design a customised sauna with a full glass front. The result is a feast for the eyes – both from the outside looking in, and from the inside looking out. Preferring user-friendly controls, Weidenfeller opted for the elegant TOUCH CONTROL sauna control panel which enables him to start any one of a number of elaborate sauna settings at the mere touch of a button. To maintain peak fitness, Roman Weidefeller also does regular weight training at home and exercises on his ergometer. Afterwards, he relaxes in the sauna – because as a professional athlete, he knows how good the soothing warmth is for tired muscles, and how beneficial the sauna is for regeneration. Roman Weidenfeller uses an intelligent module with his KLAFS sauna to target stiff muscles: the InfraPLUS optional infrared extra. Here, infrared-C radiation generates radiant energy to warm his back more intensely. Four SensoCare sensors control the intensity automatically. Roman Weidenfeller is very in demand. So he doesn’t have much time to relax. That’s why his private spa oasis includes a SWAY lounger by KLAFS. Oscillating gently, this pendulum lounger rocks the premier league star into a restful nap. For which he doesn’t even have to get undressed. The SUN MEADOW® installed above suffuses the room with all the goodness of sunshine. Dank der eleganten Saunasteuerung TOUCHCONTROL kann Roman Weidenfeller die von Saunaexperten ausgeklügelten Wohlfühlprogramme mit einem Touch starten. Die Sauna SHAPE passt mit ihrem modernen, sportlichen Design genau zum Lifestyle von Roman Weidenfeller. Mit ihren großen Glasfronten ermöglicht die Sauna faszinierende Ein- und Ausblicke. Die Rückenlehne der InfraPLUS-Infrarot-Zusatzausstattung lässt sich in mehreren Stufen in der Neigung verstellen. Auch zuhause trainiert Roman Weidenfeller mit Gewichten oder auf dem Ergometer, um in Topform zu bleiben. Danach geht es natürlich zur Entspannung in die Sauna. Gerne nutzt Roman Weidenfeller auch seine Infrarot-Zusatzausstattung InfraPLUS, um ganz gezielt Muskelverspannungen zu lösen. In seinem privaten Spa-(T)Raum kann der beliebte Bundesliga-Profi hervorragend abschalten und wieder Kraft tanken für neue Glanzparaden. Kurze Erholungspausen optimal nutzen - dazu setzt Roman Weidenfeller auf die innovative Entspannungsliege SWAY von KLAFS. Die darüber montierte SONNENWIESE® holt darüber hinaus die wohltuenden Eigenschaften der Sonne in sein Zuhause. Interesting facts about KLAFS saunas and quality. Besides saunas and a wide range of sauna accessories, KLAFS also manufactures the SANARIUM®, whirlpools, infrared heat cabins and steam baths. To ensure you enjoy your sauna for many years to come, KLAFS offer a 10-yr guarantee on privately used saunas and a 5-yr guarantee on sauna heaters and sauna control panels. In order to create durable saunas with an optimum climate, we pay extremely close attention to the quality of our materials and workmanship when it comes to sauna woods. We take our responsibility towards the environment seriously, and have been sourcing our wood sustainably for many years. This is reflected, for example, in the environmental seal of approval we received from the IHD (Institute for Wood Technology) in Dresden for our real wood veneers – the first ever to be awarded for sauna wood. In all our saunas, the seats, benches, backrests and headrests are made from softwood, which is ideally suited to this purpose. On request, we also use poplar wood. We’ve also invested a great deal of time and effort in the construction of our sauna heaters – the heart of any and every sauna. These are controlled via a user-friendly sauna control panel, which also regulates any accessories and optional extras. 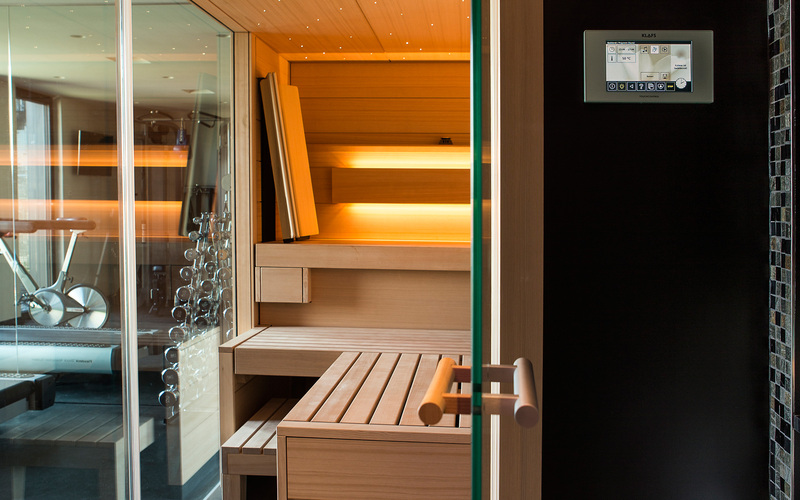 The sauna control panel allows you to create your perfect sauna environment at the mere press of a button. And the backlit display enables you to keep an eye on all key data – temperature, humidity, time, warming-up phase etc. Nowhere else on the sauna market will you find such user-friendly technology. Each and every KLAFS sauna has a personality of its own, but in some respects they’re all alike – each combines quality wood with quality workmanship; each is officially certified (RAL, VDE & GS certificates); and each privately used sauna comes complete with a 10-yr on-site guarantee. So you can relax with total peace of mind.